"In the weeks leading up to the holiday, the Bushes will host almost daily parties with some 22,000 holiday cookies, 250 coconut cakes, 600 pounds of asparagus* and 700 gallons of eggnog." 600 pounds of asparagus? Since when was asparagus festive fare? 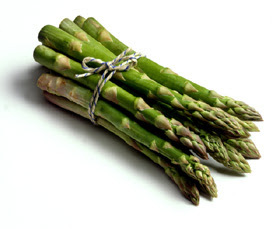 There is an asparagus season where I'm from, it's called May. Call me peculiar but if there's one thing I don't associate with the holidays, it's pee smelling like asparagus in the morning. Gingerbread, maybe, or eggnog, but not a vegetable that inspired this piece of piss-taking on wikipedia: Green asparagus is... the primary source of nutrition for inhabitants of the Atomium in Brussels. As if that's not strange enough, can you imagine what dishes they are making with the following ingredients*? I've never been one to defend the Bush administration but I always have asparagus at the holidays. It's my favorite vegetable and it only recently occurred to me to wonder if I might not be using it in the wrong season. I don't care. I'll keep looking for good asparagus, in season or out. But I do wonder what's up with the Cheesy Stone Ground Grits. What are they doing with it all?